Sand Sedimentation Separator™ (3S™) uses gravity sedimentation from a single level (stratified sedimentation) of water-insoluble, sand-sized material in water. convenient operation control on the user's PC. porous microfossils from other grains consisting of massive (non-porous) minerals. Without our Separator™, the microfossils would have to be isolated manually under microscope. This capability is important for studies in micropaleontology and stratigraphy, especially in petroleum geology. 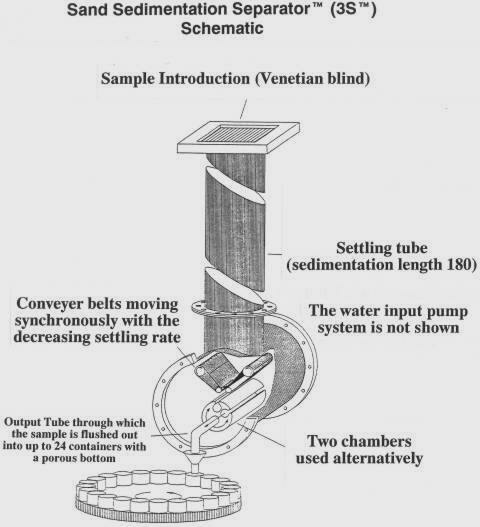 The settling tube with a sample introduction device (Venetian Blind). Both these parts are almost the same as in the MacroGranometer™; only the settling tube does not need to be suspended on shock absorbers. A separation assembly placed at the bottom of the sedimentation column; it consists of two tilted conveyor belts moving sediment into one of two alternating chambers, from which the sediment fractions are flushed out of the sedimentation column into one of the 25 sample collectors. Water circuitry driven by a simple aquarium pump with electrically controlled valves, hoses, and flowmeter (not shown in the scheme). It is connected with a water container covered by a rotating tray with 25 sample collectors, each having a porous bottom (the prototype on the scheme had 24 collectors). The water in the water circuitry (and the water container) is tightly separated from the still sedimentation water in the sedimentation column. Control electronic circuitry with an interface to the user's PC. MS DOS operational software running on the user's PC. The vertical movement of the conveyor belts tilted by 45° equals the sedimentation velocity decreasing after the sample introduction: in each instant, it equals the sedimentation length of 180 cm divided by the growing sedimentation time. The belt velocity is the sedimentation velocity at each instant multiplied by the square root of 2=1.414. Each conveyor belt is driven by a computer-controlled stepping motor. The sedimentation time is resolved into milliseconds. 0.016 - 4 mm: materials having the density of quartz 0.044 - 4 mm, heavier materials may be finer. The narrowest settling rate fraction is limited by a minimum of 3.5 seconds sedimentation time difference over a sedimentation length of 1.8 meters. Each fraction is defined by PSI values in 0.01 PSI steps. The fraction limits should be selected from the MacroGranometer™ analysis of the same sample. The statistical representativity must be maintained by taking sample splits of a good rotational sample splitter. Smallest, statistically representative samples of 15,000 - 20,000 grains, correspond to their mass between 0.1 gram for finest to 5 gram for coarsest grains.